Railway is one of the most important public transportation tools of daily life, goods transportation and economic development. High speed railway is the result of science development, which is the important symbol of transportation modernization. High speed railway transportation has a lot of advantages such as higher speed, larger transportation and lower energy consumption, which is paid more attention of many countries in the world. Combining the high-performance modular hardware with the efficient and flexible software, the virtual instrument can complete all kinds of tasks, such as test, measurement and automation applications. The software of virtual instruments integrates all the functions including acquisition, control, data analysis, results output and user interface features. Lab VIEW is a kind of graphical programming language of NI, which provides plenty of computing functions, advanced acquisition and signal analysis module, perfect simulation debugging tools, dynamic and continuous tracking mode. Through the interactive graphical front panel system and the functions, user can control the system, display the result and write programs with block diagram to complete required tasks. Lab VIEW is widely used in embedded application systems such as simulations, data acquisitions; instrument control, measurement analysis and data display. The VFD is one of the industrial drive control device. Motor running is controlled by VFD, simulating the real running condition. Using LabVIEW2011 and serial communication technology, the computer communicates with the VFD. The communication mode between computer and VFD is master-slave mode. The computer is the host; the VFD is a slave device. There is only one host in a network. The host distinguishes different slave devices through the station number. Only after receiving the reading and writing command of the host, the slave device will send data to the host. Reading and writing commands are sent by computer software to make the VFD set parameters including frequency, speed changing time and speed keeping time to control the motor running, simulating the real running conditions. Computer connects VFD with RS485 communication interface, as is shown in Fig. 1. Using the RTU mode of Modbus protocol in data transmission, the CRC-16, cyclic redundancy error check, as data checking method, the communication between the virtual instrument and VFD is realized. The communication parameters are set by computer software such as port, baud rate, data bits and stop bits and so on. VFD can be controlled via RS485 communication. The virtual vibration and temperature test and analysis instrument has the functions of monitoring and analyzing multi-channel vibration and temperature of high speed railway wheel-set. The system frame is shown as in Fig. 2. Instrument hardware: The portable data acquisition system includes NI cRIO-9073, NI 9234 vibration acquisition module, NI 9211 temperature acquisition module and serial communication card. The NI cRIO-9073 integrated system combines a real-time processor and a reconfigurable Field-Programmable Gate Array (FPGA) within the same chassis for embedded machine control and monitoring applications. NI cRIO-9073 can connect 8 NI C-series I/O module at the same time. NI 9234 has 4 synchronous acquisition analog input channels, the maximum sampling rate of each channel is 51.2KS/s, dynamic range is 102dB, A /D converter resolution is 24 bit. NI 9211 has 4 thermocouple or ±80 mV analog input channels, the maximum sampling rate of each channel is 14S/s, A /D converter resolution is 24 bit. Combining NI cRIO-9073 with NI 9234 and NI 9211, the virtual instruments can do 4-chanal synchronous vibration and temperature signal acquisition, the test accuracy is satisfying. CRIO-9073 is connected with computer by network interface, which makes it convenient to operate. The running information of tested device is obtained by the data acquisition system through vibration and temperature sensors set on the wheel-set. The information is input to the computer through cRIO-9073, NI 9234 and NI 9211. The speed signal is read from the VFD through RS485 communication interface. The input signal will be further analyzed and processed by computer software. 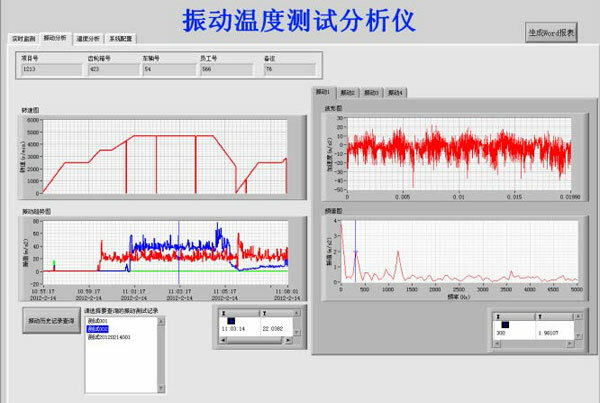 Instrument software: With general personal computer and NI portable data acquisition system, using LabVIEW2011, software of virtual vibration and temperature test system is developed. The functions of the software mainly include, the instrument's working parameters setting, testing procedure setting, real-time data acquisition, monitoring and analysis of speed, real-time acquisition of vibration and temperature signal, graphic display, historical records inquiry, report analysis, printing, file storage and management etc.. In order to improve the Hierarchy, modularity and readability of the program, the sub-VI is used in the main function, which is shown in Table 1. Sub-VI is convenient for calling and maintenance. Real-time graphic display, historical records inquiry, system parameter setting and test process setting. The panel of the virtual instrument: The panel of virtual instrument represents the advantages of virtual instrument technology. 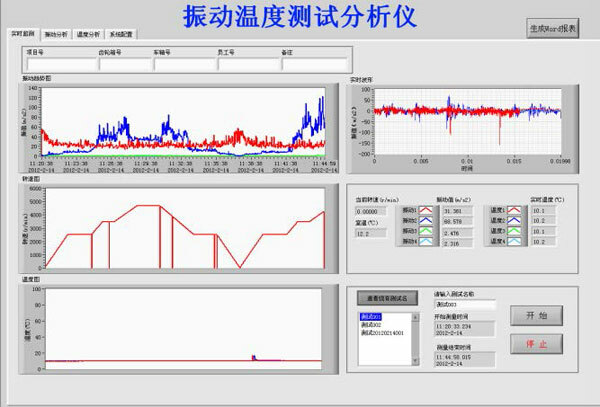 Using option tab, the functions including real-time monitoring, history inquiries and the system parameter setting are realized. Real-time monitoring interface mainly consists of the graphic display area, function choice and control area, the area of real-time information and state display. The speed information, time domain waveform of the vibration, vibration trends and temperature changes are displayed in the graphic display area in real time. The measurement method of the vibration, including acceleration, speed or displacement mode can be chosen in the function choice and control area. Measurement data and status are displayed in Real-time information and status display area. History inquire interface includes history query and analysis of vibration and temperature. Selecting the contents which the user wants to inquire though list box, the corresponding historical records will be called to draw speed chart and the temperature variation graphics and the vibration history trend chart and make spectrum analysis of the historical waveform to draw amplitude frequency curve, which will provide a basis for further vibration analysis and fault diagnosis. The testing process is set in the system parameter setting interface, including speed, speed changing time, speed keeping time and other information. Vibration monitoring and analysis: Using time domain and frequency domain analysis method, the vibration signal is analyzed. The time domain waveform is the original signal, it not only contains large amount of information, but also is intuitive and easy to understand. It can be used for the preliminary fault judgment of the device. Fast Fourier Transform (FFT) can show the spectral components contained in the time domain vibration signals. By spectral analysis of vibration signals, the vibration changes of the characteristic frequency will be achieved and the causes of fault and type will be judged. The instrument provides three measuring methods for vibration analysis including acceleration, speed and displacement. When measuring the vibration, the acceleration measurement provided by the NI9234 is chosen. The vibration signals input the computer is acceleration waveform signal. In order to provide a more flexible way of vibration measurement and analysis, the integral transform function and linear fitting function provided by LabVIEW2011 are used and acceleration waveform is changed to velocity or displacement waveform by VibModeC.vi sub-VI. After being processed, the data is used to draw the corresponding real-time vibration trend and waveform graghics. Communication software of the instrument and the VFD: The instrument communicates with the VFD through the FreCom.vi and the Time Delay Controller which controls the running state of the motor. The speed and speed changing time is compiled into hexadecimal string commands shown in Table 3 and the instructions are sent to the designated port to control the variable frequency drive. The speed keeping time is controlled by the time delay controller. When the program started running, the test process should be set first, including speed information, speed changing time and speed keeping time, which will be put into a two-dimensional array in the form of a spreadsheet file (XLS) saved in the corresponding folder. When the test begins, first, read the test process file and then return data to a two-dimensional array. The instrument software will read parameters according to the order of the elements in the array and then converts it into hexadecimal string, after CRC checking, send writing command to the VFD through the designated port. After receiving instructions, the VFD will control motor to simulate the actual working condition. The last column of the array stores the speed keeping time which will be put into the time delay controller with a FOR loop, then the speed keeping time needed is obtained. The commonly used data format is shown in Table 2. The Virtual Instrument monitors the speed and vibration information in real-time. On one hand, the Instrument sends speed rise-and-fall command, speed changing time to the VFD according to the parameters setting by the program. On the other hand, after the VFD receives the commands, the Instrument should read the speed and vibration information in real-time, monitor the speed and analyze vibration and then draw graphics. To avoid the interference of writing and reading commands of the VFD with each other, Case Structure and Sequential Organization programming are used to ensure that the commands can be read successfully after they are written. The Instrument uses the time delay command to control the speed keeping time. File management: During the test, lots of real-time data will be generated. So it is very necessary to classify, store and manage those data for statistical analysis. The file manipulation and management methods provided by LabVIEW2011 are used to manage the real-time data. The data classified by testing name are stored in the corresponding folder. Speed, vibration and temperature data are stored as measurement files which form is binary format (TDMS). In order to use cursor display in the history inquiry, the real-time waveform is stored as a file per section. When inquiring historical reports, a cursor point in the history trends chart corresponds to a real-time waveform in a certain time, as shown in Fig. 3b. Applications: This Virtual Instrument has been applied in the maintenance test of high-speed train wheel-set. The test process can be preset according to the user's need. This test lasted for 2 h, the Virtual Instrument controls the VFD which controls a 22 kW motor. The speed adjustment is achieved. Before running, the test process should be set first, including speed, the speed changing time and the speed keeping time. Then after finishing all the settings, run the test program, do the setting process, read-in the speed, vibration signals, temperature signals, then monitor and analyses those data, as shown in Fig. 3. When the test is completed, the test data will be saved and the reports can be printed if necessary. The test shows that the interface of the virtual instrument is friendly, the operation is very easy, the graphics is intuitive, the results are accurate and the historical inquiry and report print are very convenient. Vibration is one of the main reasons leading to the fault and noise pollution of high speed railway wheel-set. To ensure the reliable running of the wheel-set, it is very necessary to test and analyze vibration. Using VFD, portable data acquisition system including cRIO-9073 system, NI 9234 vibration acquisition module, NI 9211 temperature acquisition module, serial communication card and computer as hardware, LabVIEW2011 as software, a virtual vibration and temperature test and analyzing instrument is developed. 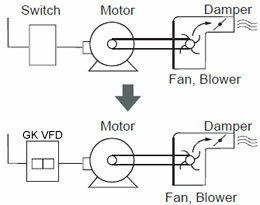 Through reading and writing commands to VFD, the motor is driven to execute the test process which is preset before testing, the actual operating conditions of the wheel-set is simulated. It also can be used to monitor and analyze the real-time vibration and temperature of other rotating machine.